The board is selling 200 tickets for $100 each for land to finance an elevator to the second floor concert hall famous for its acoustics. 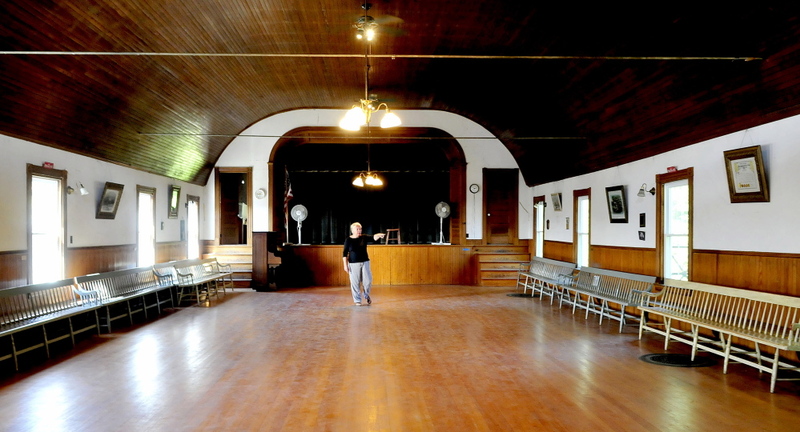 CANAAN — Maine cowboy singer Yodelin’ Slim Clark once said that the Canaan Grange Hall had the best acoustics of any performance venue in the state. Clark, who died in St. Albans in 2000 at age 83, would have loved to see the old place today — all fixed up and ready for more dances, plays and concerts. • Art and Quilt Show Noon-5 p.m.
• Contra Dance 8-10 p.m.
• Art And Quilt Show Noon-4 p.m.
• BBQ Beef Brisket dinner Noon-2 p.m.
• Ice Cream Social 2:30 p.m.
• Land Raffle 3 p.m.
On Sunday, the hall, now known as the Canaan Farmers Hall, will get another boost to renovations that will provide a way for older folks who still enjoy a night out on the town to get upstairs to the concert hall — a chair-lift elevator. The Farmers Hall board of directors will hold a raffle at 3 p.m. Sunday for 1.28 acres of land on Hinckley Road. Raffle tickets are $100 each and there are 200 of them. Board President Kathy Perelka said that as of Monday 150 tickets had been sold, leaving 50 raffle tickets left. “Some lucky person will win the lot for $100,” she said. The land, listed as a house lot, has a drilled well, a driveway, a septic system and frontage on Carrabassett Stream and Route 23. The property was donated to the Farmers Hall by town residents Bill and Louise Townsend. It is next the new Canaan Public Library, which is on land also donated by the Townsends. The library is expected to be occupied next month. Louise Townsend, who is a member of the Farmers Hall board, said the Canaan hall was a favorite place for Yodelin’ Slim Clark to perform in the 1940s and ’50s. The $20,000 in proceeds, added to the $15,000 raised at the annual Town Meeting in March, will pay for the elevator to be installed inside the former Grange hall. The total project is expected to cost $35,000. “We knew we were going to be working on the handicapped lift this year,” Perelka said Monday. “Bill and Louise called me and offered this lot of land to be sold or to somehow benefit putting in the lift. There’s no way for anyone who is handicapped to get up there, that’s the big thing. This one will meet (Americans with Disabilities Act) requirements. A real estate appraisal of the property valued it at $19,000. The town of Canaan appraised the lot at $15,000. When Bill Walker died in May 2009, the Canaan Grange No. 239 lost its overseer, principal organizer and one of its longest-serving members, according to a report published in 2010. The building, completed in 1897, stood empty for about a year. Members drifted away and the remaining ones could no longer pay the dues to the Maine State Grange. When town residents voted against buying the building and the Maine State Grange arrived to cart away the furniture, plates and photos on the walls, Bill Walker’s wife decided to make one last effort to save the old place on Main Street, according to the article. Pearline Walker, Bill’s wife, asked the state Grange to give the community a week to come up with the $408 owed in back dues before selling the building. A small group of Grange members, now the Canaan Farmers Hall board, raised the needed money for back dues in 2010 and in August 2012 acquired the building from the state Grange with the support of the town, friends, neighbors and the Maine Community Foundation. It also secured nonprofit status with the Internal Revenue Service. In 2013 the board replaced 38 windows with energy efficient ones, but the inside of the two-story hall with a balcony is all original maple floors and stained pine wainscoting and ceiling, Perelka said. The hall still is used for public suppers and a farmers’ market, Perelka said. Contra dances are held upstairs, along with art shows and a quilt show. “The more we can use this hall, the better,” she said. Perelka said all of the purchased raffle tickets will be placed in a large ball and bounced from the hall’s balcony onto the dance hall floor. A child will be selected at random to corral the ball, open it and produce the winning ticket, she said.